In his relatively short directing career, David R. Ellis has contributed quite a bit to the horror genre. In 2003, he directed the second installment in the popular Final Destination series, and three years later he helmed the internet phenomenon known as Snakes on a Plane. While Snakes failed to live up to the internet hype at the box office, I was quite surprised to see that Ellis's next effort would be a direct-to-video offering named Asylum. A recent Fangoria article for the film caught my eye, and I was even more intrigued when I found out that filming for the film took place about an hour from my hometown. Apparently, South Carolina is becoming a hot-bed for filming, as both Death Sentence and The Strangers were also filmed down here. Thus, I was sufficiently curious enough to check this out when my local rental store had it in stock. Asylum opens with a young boy and girl witnessing the suicide of their insane father before flashing ahead to the present day, where the girl, Madison, is now a full-grown young lady going off to the fictional Richard Miller University. She, along with some more lucky co-eds will be staying at the college's brand new dorm facility; however, some of the students soon learn that their dorm has been converted from an old asylum that once housed the diabolical Dr. Burke, a mad doctor who used unconventional methods to treat his mental patients before they revolted on him and left him for dead. However, local legend claims that the old doctor never died at all and that his ghost still roams the asylum. Legend then becomes reality as the doctor appears and begins picking off the students one by one by using their past traumas against them. The film seems to be inspired by the Nightmare on Elm Street series, as the villain here, Dr. Burke, is reminiscent of Freddy; more specifically, the film is resembles Dream Warriors, as all the kids here have experienced some kind of traumatic experience in the past: one girl was sexually abused by her father, one guy had a drug problem that resulted in the death of his brother, and another girl was the victim of an abusive relationship. Thus, Burke uses all this against his victims to psychologically torture them before killing them. Burke also seems to gain some sort of pleasure from their pain, as he implores them to "give him their suffering," which gave me a bit of a Pinhead vibe. So Asylum borrows themes and characters from those more famous horror films, but is it nearly as good? To be blunt, no, it isn't; however, how many films (not to mention DTV films) can live up to such lofty standards? While it doesn't necessarily offer anything new to the genre, Asylum is at least entertaining. Ellis's direction is as slick and professional as it always is, and the acting is good, even if most of the actors are only working with horror cliches. On this note, the film is at least a little surprising in the order of deaths; you'll be able to peg the survivors down fairly quickly, but the rest are dispatched a bit more unpredictably. The music is serviceable, and the film actually looks like it could have been a theatrical release. As a horror film, it mostly relies on an abundance of jump scares and the gore during the death scenes. 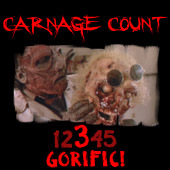 The gore isn't overly done, but there are a couple of scenes that might have you squirming a bit. The film's atmosphere is decent, as I've always enjoyed ghost stories that are set in old, abandoned buildings like asylums (of course, this film doesn't compare to another movie with a similar setting). Burke himself is an interesting villain, and Tobin Bell look-a-like Mark Rolston does a good job of bringing the sadistic madman to life. Also, genre fans will recognize a cameo from New Line favorite Lin Shaye, sister of the legend himself, Robert Shaye. Asylum isn't likely to blow anyone away, but it's got a fairly interesting story, and it is well directed. I look forward to Ellis's next effort, as he returns to the Final Destination series to helm the three-dimensional fourth installment next summer. Asylum comes to DVD from MGM/Fox, who have given the film a good presentation, but not much else. The picture is about as good as you can expect from the DVD format these days, as the colors are rock solid, and the picture is clear. The 5.1 soundtrack is appropriately aggressive and will have you jumping out of your seat from time to time. There are no extras, but there are some trailers for other films preceding the main menu. Like the film itself, the DVD is unremarkable, but it gets the job done. Asylum is a solid little film, to be sure. It was certainly more rewarding than many direct-to-video offerings that have come my way lately. Rent it!